Pauwa Cocktails FTW! Been To Bombay Brasserie Yet? 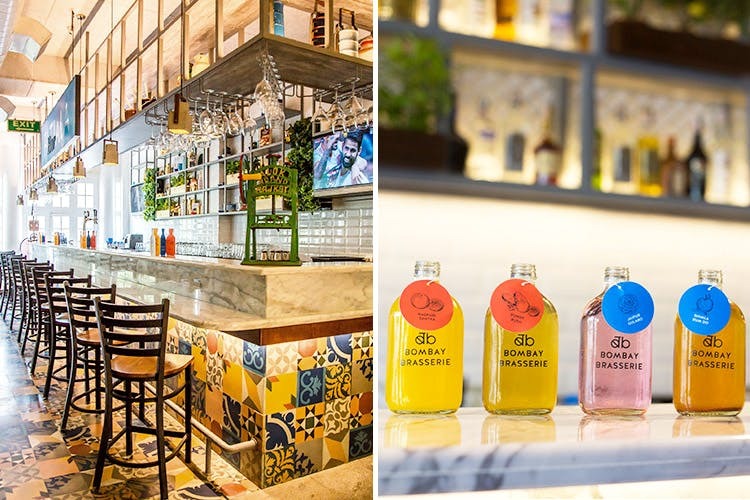 Bombay Brasserie is a restaurant and bar known for its food that's prepared with ingredients sourced locally from all over the country, and drinks that are inspired by different cultures in India. They've opened their 8th outlet in CP, New Delhi (& first in Delhi)! With a menu armed with starters, small plates, big plates, street grills, and desserts, Bombay Brasserie has a variety of dishes made with locally-sourced ingredients from all over the country— Aam Papad from Amritsar, Kashundi from Bengal, Em-ma from Shillong, Vinegar from Mapusa and more, all contributing to the authenticity of the food (you'll see all the unique ingredients and where they are sourced from on the menu). You’ll find options like Marathi Jhinga Mirch, Naga Ghost Pepper Wings (these are dusted with Bhut Jolokia, which is one of the world’s hottest peppers), Goan Pao Puffs, Achari Biryani and more on the menu. We loved the Chilli Cheese Kulcha, the Fiery Thecha Prawn, the Bombay Dabba Gosht, and the Bombay Ice Cream Sandwich for the dessert. For drinks, they've got killer pauwa cocktails inspired from different regions which are paired with the right chakhna, homemade liquor infusions and desi mocktails to wash it all down with. Our favourites were Molly Lolly, Calcutta Kick, and Bombay Collins. The interiors are made up of quirky decor, vines, plants, and wooden furniture. They've also got a section where the roof is retractable—for those perfect, breezy days. Bombay Brasserie is more like a sit-down, dinner and drinks type of a place (perfect for celebratory family dinners). In case you're expecting it to be a buzzing party place, you will be disappointed.